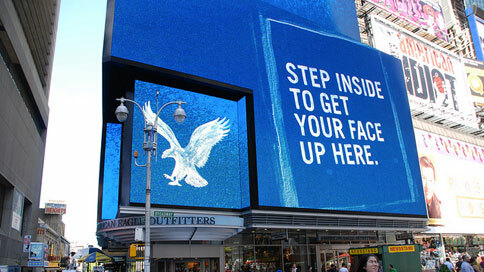 When American Eagle opened its Times Square store in late 2009, most of the attention was on the retailer's sprawling 25,000-square-foot, four-story floor plan. But in the year and half since then, it's the brand's towering building-side LED display that's had the most noticeable impact, even in one of the world's most notoriously cluttered visual landscapes. By the numbers, this digital ziggurat is 15,000 square feet of LED, climbing 25 stories above Broadway and playing animations 18 hours a day. It's one of the nation's premium ad spaces, not only for American Eagle but for the brands and charities that buy (or are given) space there. We've compiled 10 of the more interesting ways the display has been used. Check them out after the jump. It's not every day that an advertising display itself gets free advertising, but that's essentially what happened when American Eagle's space became home to a massive ad celebrating Foursquare. Sure, it was a great deal for Foursquare, which reportedly didn't pay a dime, but the flood of photos and blog coverage were also great publicity for the Times Square display itself. After the devastating Haiti earthquake in 2010, American Eagle partnered with Filter magazine to sell a compilation CD, "Hear to Help," with all proceeds going toward Oxfam's relief efforts. This video featuring the people of China was commissioned by the Chinese government to help pave the way diplomatically for President Hu Jintao's visit earlier this year. Rounding out our trio of international executions is this colorful tourism display for Mexico, which used the ad as part of a campaign aimed at convincing Americans and Canadians that their southern neighbor has more than just beaches. American Eagle ratcheted up the patriotism for Fleet Week. Not a bad idea when you've got thousands of sailors and Marines in town looking to check out Times Square. What, no augmented reality? Audi seemed to pack every other hot bit of mobile tech into this display, which featured QR codes, SMS and location-based check-ins via Facebook Places or Foursquare. By scanning the QR code, you could access a mobile site that let you tweet a message to Times Square. Or learn about the new Audi A7, I suppose. Before we wrap up, I wanted to show some love to the people behind the scenes. To build the display, American Eagle hired the Barnycz Group to design it, with the screens provided by Barco and the computer systems set up by Activate the Space LLC. R/GA creates much of the content, and the ad space is sold by ABC Regional Sports & Entertainment Sales (which we also thank for providing much of the art for this post).